This page refers to the Game Boy Color port of the game of the same name. For other uses, see Donkey Kong Country (disambiguation). The boxart for the Game Boy Color port of Donkey Kong Country. 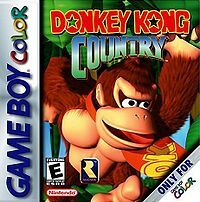 Donkey Kong Country is a video game released for the Game Boy Color that is a remake of the original Donkey Kong Country. This game stars Donkey Kong and Diddy Kong. This article has been tagged as a featured stub. As per Featured Stubs, it has been requested by someone in the community to be the focus on editting efforts to improve quality, structure, information, etc. This page was last edited on 28 October 2018, at 19:19.